Gold, permanent store of value that it is, becomes even more precious in an environment where fiat currency is rapidly becoming truly worthless. 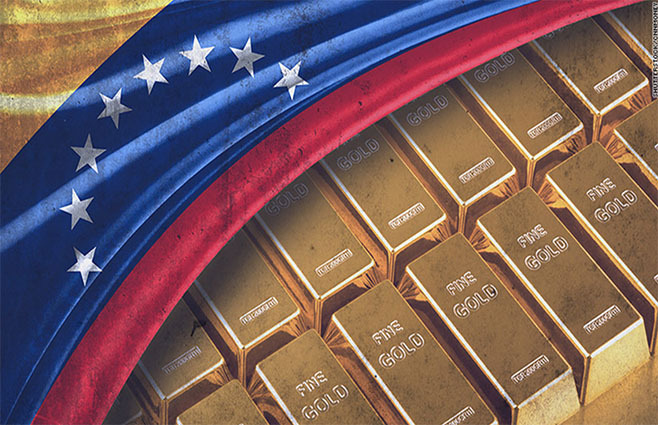 It is no surprise that the military has taken Venezuela’s gold mines. The United States made it illegal to own gold in 1933 when it faced The Great Depression. There are many reasons why physical vault storage outside the US banking system is a shrewd investment decision, and GoldSilver’s secure vault storage, available at four worldwide locations, is a turnkey, affordable way to avail yourself of the benefits. Venezuela has become known for its shortages. Toilet paper is a luxury and bread almost impossible to come by. Amid the misery, however, Venezuela is well-stocked in military might, armed gangs, and, yes, gold. There’s plenty of gold in Venezuela, a country where people are dying daily from hunger and disease. The question is, who is benefitting from this elusive element? In the city of El Callao, military convoys have become the norm. Soldiers wander the streets with their faced covered and rifles ready. What’s so special about the once prosperous coastal enclave of El Callao? There are massive amounts of gold to be mined in the region. The government calls it the Arco Minero del Orinoco. The gold is not being mined for the benefit of the Venezuelan people. President Nicolas Maduro has permitted the military access to El Callao and its riches. As any dictator is well aware, having the military on your side during troubled times is essential. Soldiers have been raiding neighborhoods and fighting gang lords to get at the gold. It’s meant to be their reward for keeping the people in check and the unpopular president in power. These soldiers aren’t merely strutting through the streets. They have confiscated weapons, set fire to vehicles and killed 18 civilians. The army is in control of El Callao. This is where force reigns and civilians cower in fear. Socialism has turned Venezuela into a country with an abundance of gold, but without food to feed its citizens. Once again, socialism has shown that it can only lead to failure and misery.